Hello! Welcome to the first Making the Seasons post of 2018 - a little later than planned, but it's been that kind of month for Lucy and I.
I was worried that I wouldn't have much interesting to show you today, and even thought about skipping a month. But I think it's really important to be honest here and say that yes, January was a difficult month, and no, not a lot of crafting got done, but what little I did do felt really good and helped me a lot. The kind of projects I choose in January always feel a little more self indulgent than at other times of the year. With Christmas behind me and no birthdays for a few months, I can put aside thoughts of gifts and work on things that are solely for me - jumpers, socks, little things for our home. I like that. Something I've been doing a lot this month is buying cheap pots of bulbs from the supermarket or garden centre - hyacinths, usually - and repotting them in pretty bowls and tubs. I don't know why I never did this before - it's so much easier than trying to find plant pots in the garage that fit the plastic pots the bulbs come in. I always love the spring bulbs that come into the shops in January and feel ready for that fresh lift of green in the house after all the Christmas decorations have been taken down and it's all looking a little bare. It's also a nice excuse to get out some dishes I don't use as much and give them a focus. Just gently lift the bulbs from their pot, re-position in your chosen bowl, then top with compost and, if you have it, a little moss looks pretty on top to hid the earth. These tete-a-tete bulbs don't look very exciting now but in a couple of weeks they'll send up bright shoots of green to cheer up my mantel. I love how this one looks potted in a clear glass bowl. I've been crocheting bed socks too, the same pattern as the pairs I made just over a year ago. I just love them - I can't get to sleep if my feet are cold and I wear them almost every night in the winter. I like their warmth, obviously, but also the way they don't dig in and leave an imprint in my ankle which itches, as tighter socks do (anyone else know what I mean?) I think I must get a bit of water retention in my ankles or something. 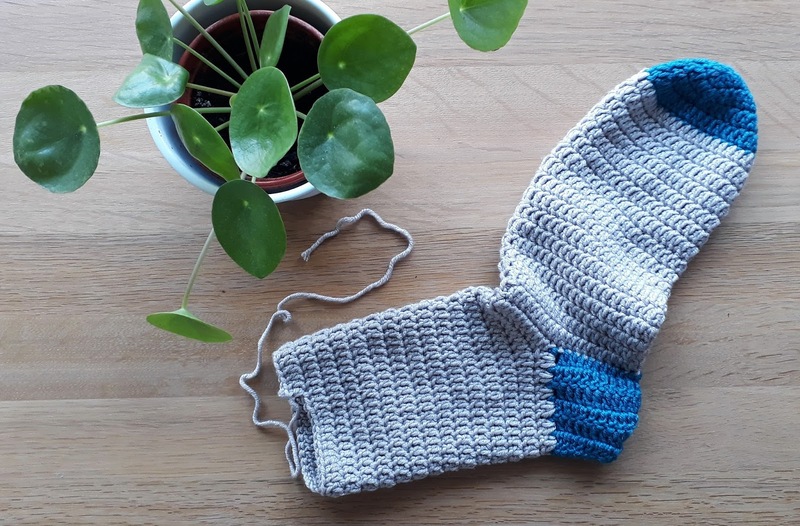 So I'm making myself a new pair in grey and dark blue; sleepy, January colours. I also made a pink pair for my mum. They were supposed to be for Christmas but ended up being an early January gift - luckily she's very understanding! I've also been enjoying the winter edition of my Craftpod box. These boxes are truly such a delight, I love everything about the choice of projects and the styling. My kinds of projects, my kinds of colours. plus tools and patterns to create your own stamps. And the element I think I like the most is the self care part, the chocolate, tea, stickers and postcards, little treats that remind you that it's ok to sit down and do something for yourself for a while. Necessary, even. I found an hour at the weekend and made a start on the winterberry design. I got as far as sewing the branches and outlining just a few of the berries. That's ok though, I'll finish it in my own time. A project like this is not for rushing, but for savouring slowly here and there in little moments with a cup of tea. Part of my intention with Making the Seasons was to create in a way that would tie in with the seasons and support me through the months of the year, and I feel that crafting has really looked after me this month. My friend Lucy at Attic24 has also been trying to make space for a little quiet crafting in a very busy month, so do please pop over to her gorgeous, colourful blog and say hello and read about Making the Seasons post. I love how the plants look, that was very clever. I would love to buy some hyacinths but they never seem to get very cheap here. It feels like a real indulgence to have some, but I often do buy one, usually closer to Easter. Your embroidery is very sweet. I'm glad you're doing things to look after you. I like your idea of transferring the bulbs you've bought into pretty bowls - it's one I've not thought of either. Slow stitching is the perfect way to while away some wintry hours and the little embroidery is just the right embroidery project for that. Inspiring! Especially with admitting the difficulties - reminds me there is always room for a little self-care and crafting. I hosted a family dinner last Sunday, and my Mum and Dad brought me a huge bunch of yellow hyacinths - they really lit up the whole grey day and look so good in my living room against the light grey patterned wallpaper. The craft box is a great idea, and the embroidery will look so pretty in your home. Lovely blog and so calming. Thank you. Oh I must start my craftpod box. I have so many things I want to make in my head that it's hard starting any one of them! Isn't the Craftpod box great? Haven't heard of these before and they're probably not available in Australia. I refer to your Calendar Cooking Challenge in my blog today and have put a link. Love your blog! Lovely makes Gillian. Your socks are brilliant & I'm off to look for the pattern & give it a go. The embroidery is looking good too. The craftpod boxes are certainly like opening a gift to yourself. Have a great weekend & take care. I love how all of your plants look, especially the hyacinth in the glass bowl. They remind me that spring is right around the corner. I planted parrot tulips outside in a pot this year for the first time, and I can't wait for them to bloom!